Photographs in and around Malakwal, north west of Lahore. The track here is broad gauge, 5ft 6ins (1,676mm), and at the time it was famed for still using the SPS 4-4-0 class on passenger trains. 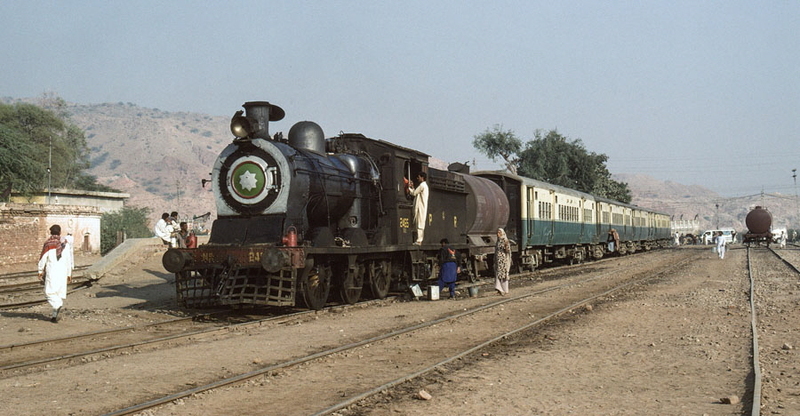 The tour group’s two railway carriages were stabled in Malakwal station, which was very convenient for photographing early morning and late evening trains. 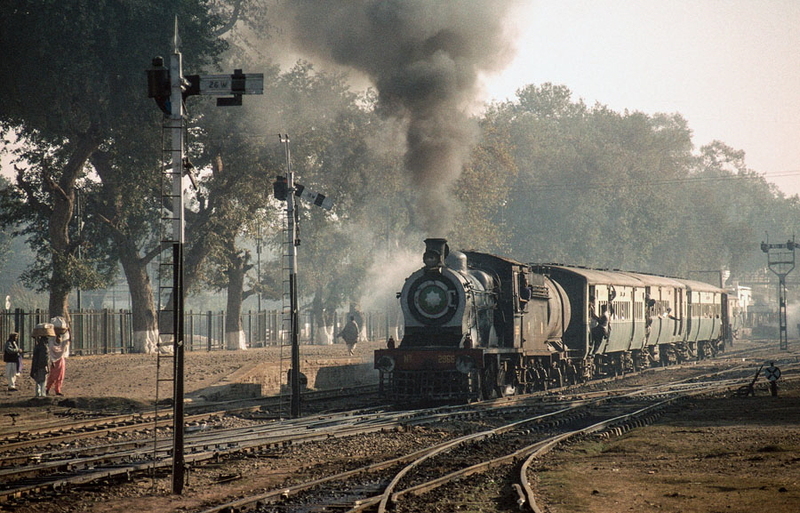 1-of-18) Malakwal station just after dawn with one of the broad gauge, oil fired, BESA (British Engineering Standards Association) class SPS (Standard Passenger, Superheated) 4-4-0 locomotives. This is no. 3159 (built by Vulcan Foundry, in 1911, and later superheated) with a glow underneath from the operating oil burners, though their loud roar unfortunately cannot be conveyed by the still photograph! 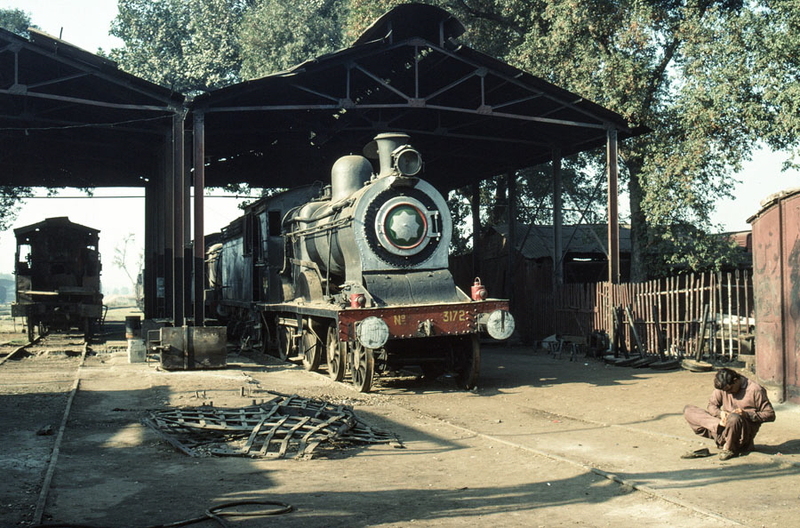 2-of-18) Out of use, broad gauge, oil fired, BESA (British Engineering Standards Association) class SG (Standard Goods) 0-6-0 locomotive, at the end of the branch at Gharibwal. No. 1055 was built by Vulcan Foundry, in 1906 for the North Western Railway, and unlike many other of the SG class was not subsequently upgraded by adding a superheater. The tender of this weather-worn locomotive carries the faded lettering “P. W. D.” (probably standing for the Punjab Public Works Department) on top of “IRRIGATION DEPTT”. 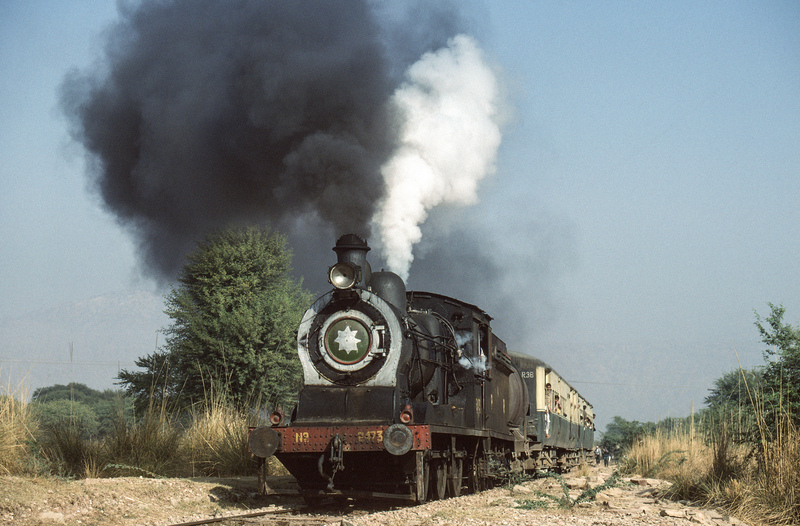 3-of-18) Broad gauge, oil fired, class SGS 0-6-0 2473 (Vulcan Foundry, 1923) departs Gharibwal station for Malakwal. This was actually a “false Start”. That is the tour group were about to travel on this train. It made a vigorous “departure” so that the group could photograph it, then it stopped and reversed to allow the group to get on it before departing properly. And this was a timetabled service train with passengers! I am not sure what they thought! The hills seen through the haze in the background are part of the Salt Range, which derives its name from its extensive deposits of rock salt. 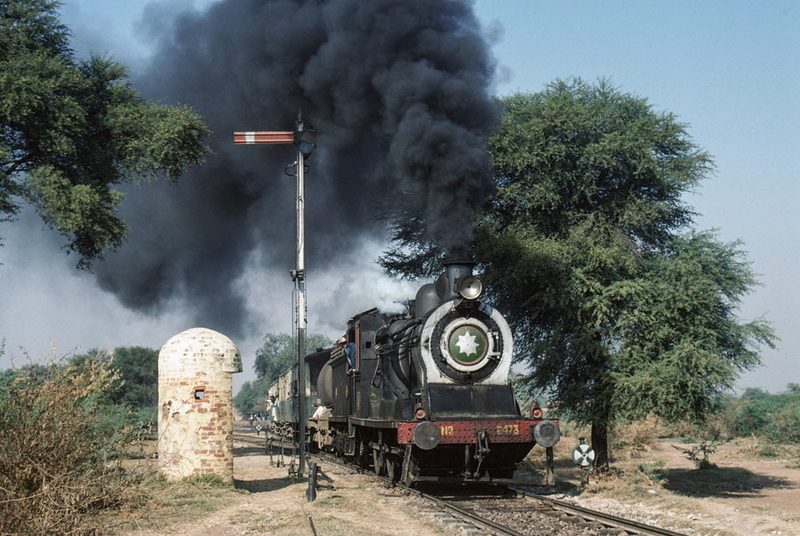 4-of-18) Broad gauge, oil fired, class SGS 0-6-0 2473 (Vulcan Foundry, 1923) performs a run-past between Gharibwal and Haran Pur on its way back to Malakwal. Since the tour group were travelling on this train it stopped so that they could get off. The train then reversed for some distance before making a vigorous run-past so that the group could photograph it. The train then stopped and reversed to allow the group to get on it before setting off again. This was a timetabled service train and the normal passengers had to put up with it! 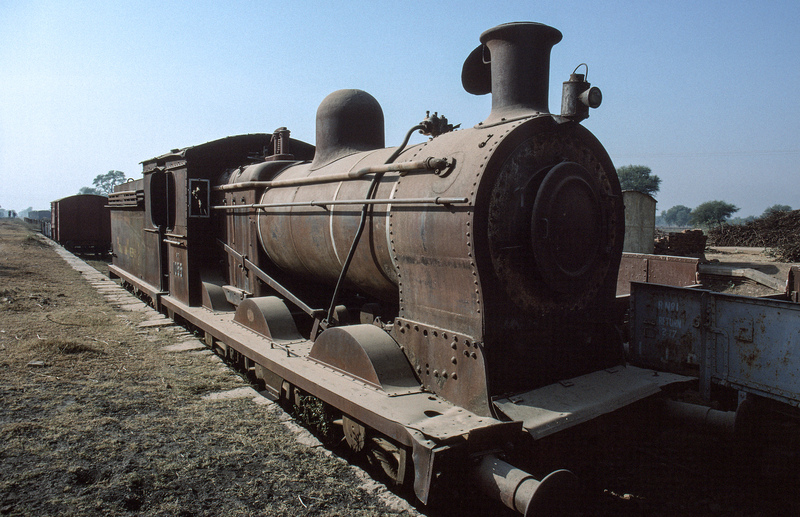 5-of-18) Broad gauge, oil fired, class SGS 0-6-0 2473 (Vulcan Foundry, 1923) calls at Haran Pur station with the train from Gharibwal to Malakwal. 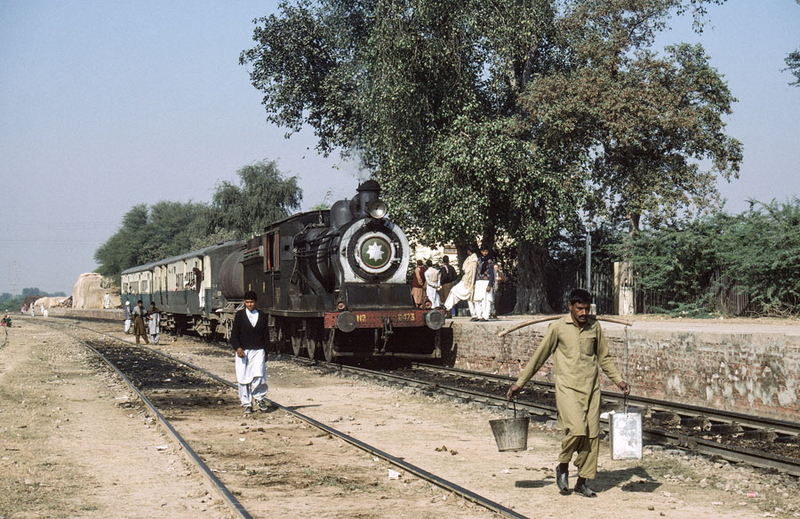 Haran Pur is the junction for the branch to Gharibwal and the branch to Khewra. 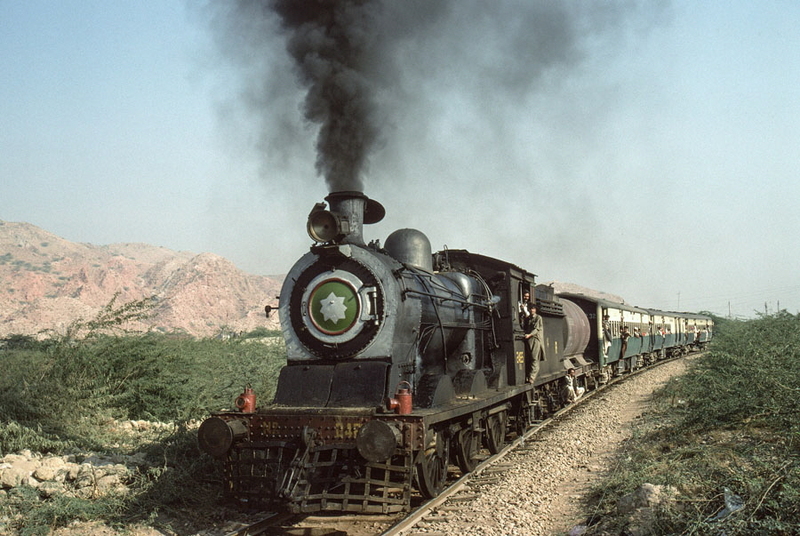 The tour group alighted here from the train from Gharibwal in order to catch a train to Khewra. The locomotive and its tank wagon, which provided an additional supply of water, were tapped by locals as a source of water, as here. 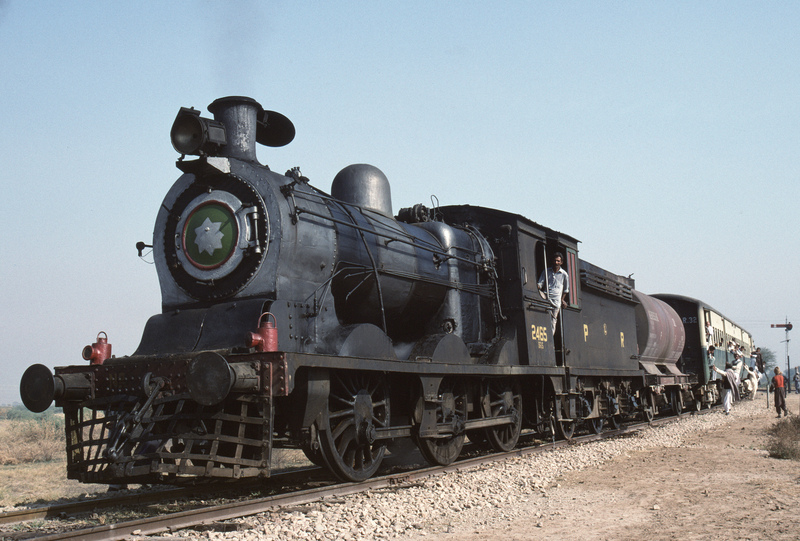 6-of-18) Broad gauge, oil fired, class SGS 0-6-0 2473 (Vulcan Foundry, 1923) departing from Haran Pur station with the train from Gharibwal to Malakwal. 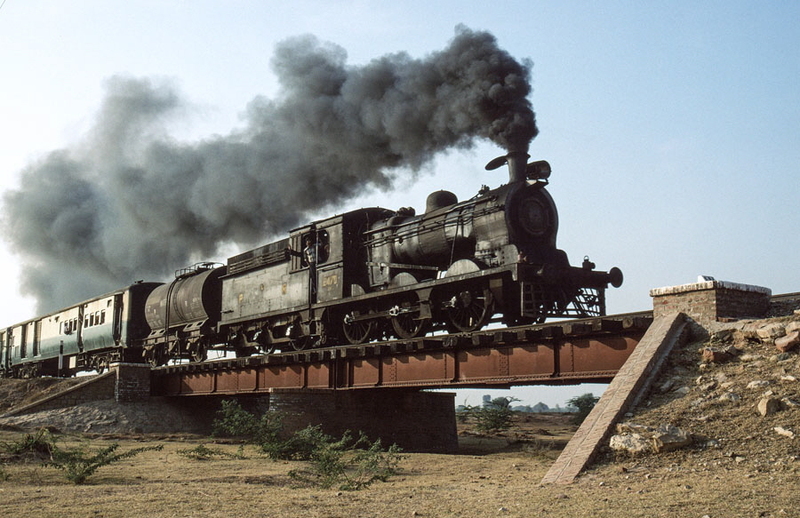 7-of-18) Broad gauge, oil fired, class SGS 0-6-0 2465 (Vulcan Foundry, 1920) crosses a dried-up river near Khewra with a train from Malakwal. 8-of-18) Broad gauge, oil fired, class SGS 0-6-0 2465 (Vulcan Foundry, 1920) has arrived with its train at Khewra station, the end of its journey along the branch from Malakwal. Note the locals collecting hot water from the locomotive. 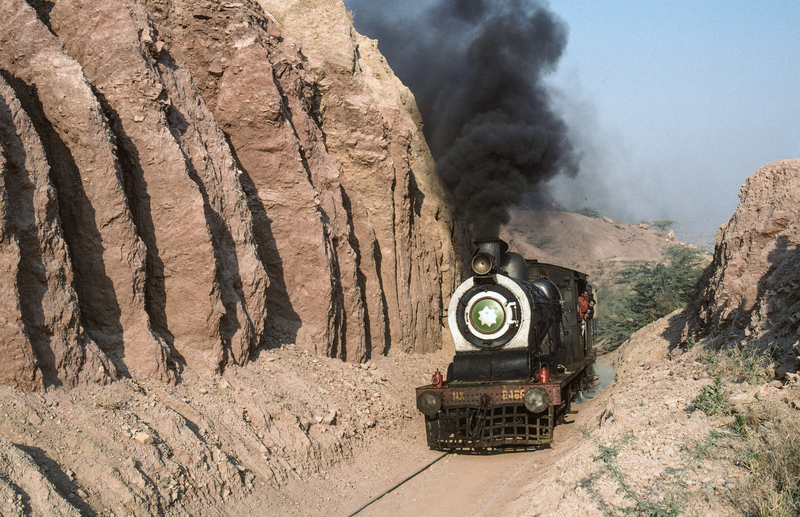 9-of-18) Broad gauge, oil fired, class SGS 0-6-0 2465 (Vulcan Foundry, 1920) performs a run-past at a spectacular cutting on a steeply graded section beyond Khewra towards Dandot. 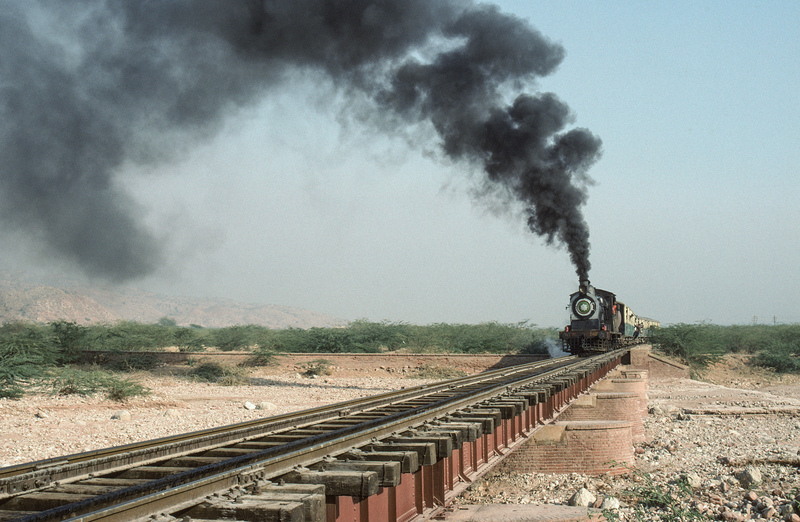 The line from Kewra on to Dandot was disused and this was about the limit of track in usable condition, so after the run-past the train reversed back to Khewra. 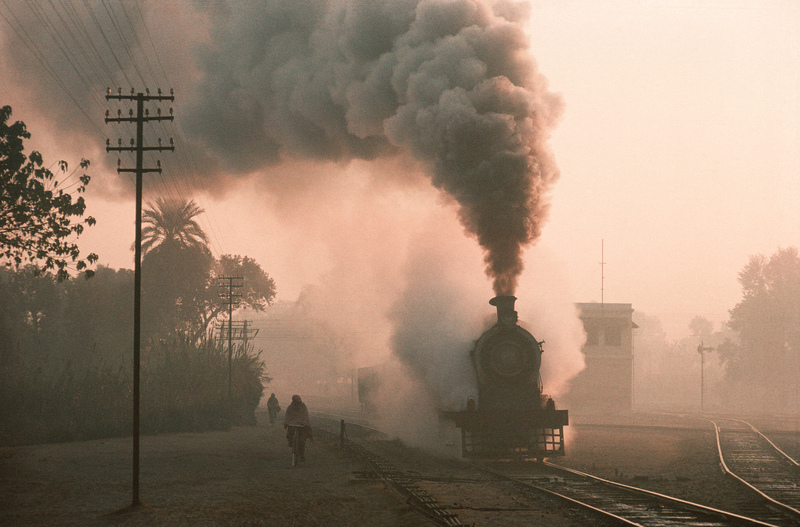 10-of-18) A broad gauge, oil fired, class SGS 0-6-0 departs Malakwal station with a passenger train just after dawn. 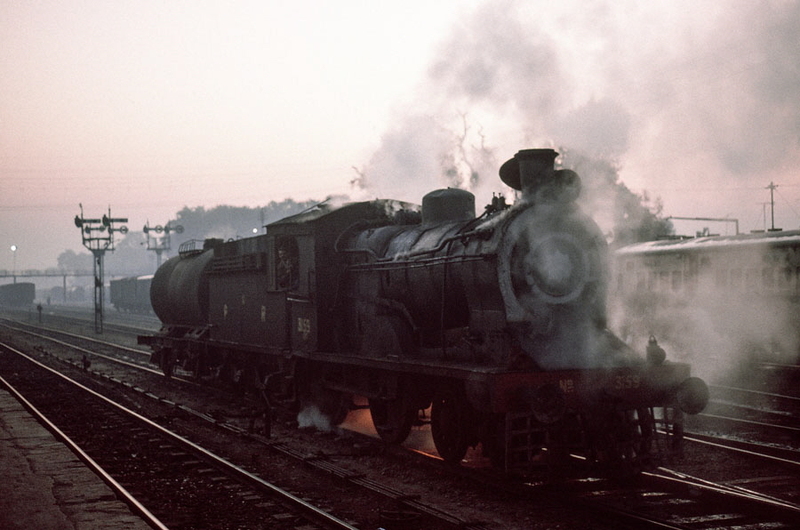 11-of-18) Broad gauge, oil fired, class SPS 4-4-0 2966 (Vulcan Foundry, 1911) prepares to back onto an early morning passenger train at Malakwal station. 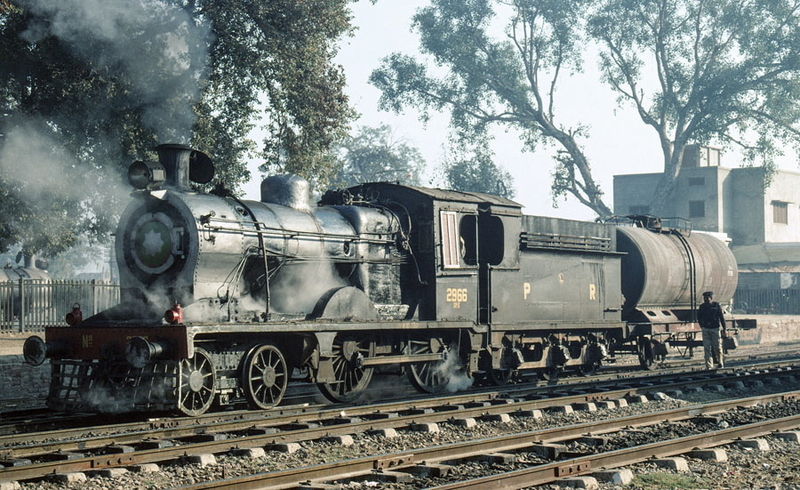 12-of-18) Broad gauge, oil fired, class SPS 4-4-0 2966 (Vulcan Foundry, 1911) departs from Malakwal station with an early morning passenger train,. 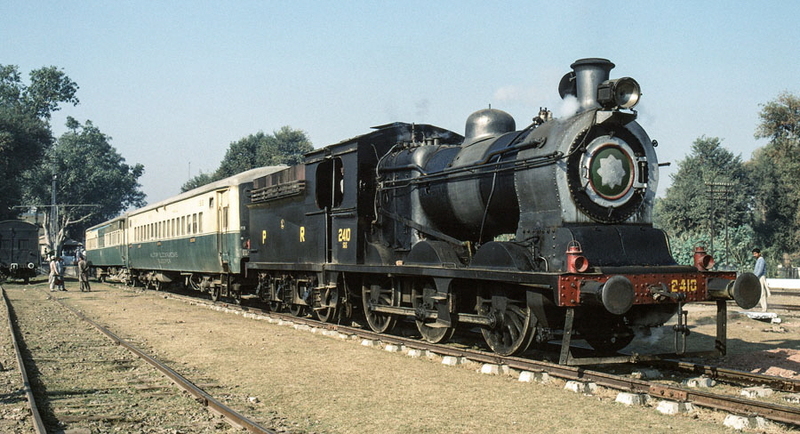 13-of-18) Broad gauge, oil fired, class SPS 4-4-0 3172 (North British, 1912) stands in Malakwal locomotive shed. 14-of-18) Broad gauge, oil fired steam locomotives, class SPS 4-4-0 2969 (Vulcan Foundry, 1914) and class SGS 0-6-0 2405 (Vulcan Foundry, 1916/17), without tender, stand outside the locomotive shed at Malakwal, Pakistan, 22nd December 1993. 15-of-18) Broad gauge, oil fired, class SGS 0-6-0 2410 (Vulcan Foundry, 1916/17) returns the tour group’s dining carriage and sleeping carriage to Malakwal station after taking them to be serviced and refilled with water. 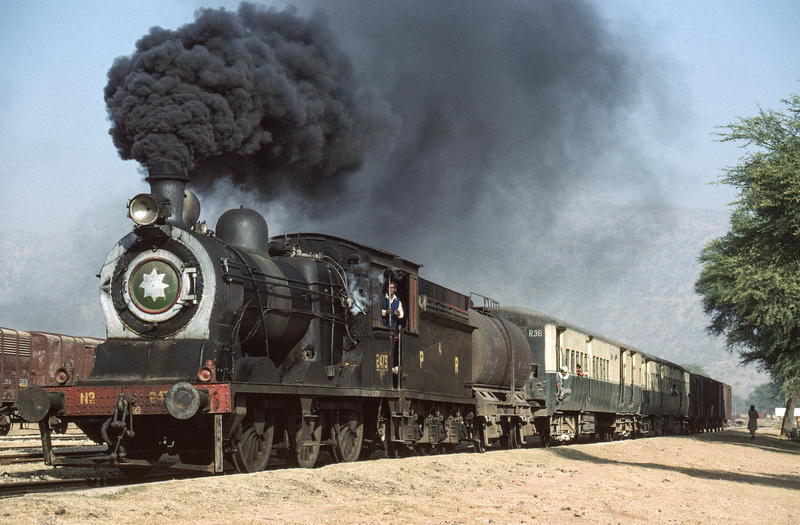 16-of-18) Broad gauge, oil fired class SGS 0-6-0 2465 (Vulcan Foundry, 1920) with a passenger train at Chalisa Junction. 17-of-18) Broad gauge, oil fired class SGS 0-6-0 2465 (Vulcan Foundry, 1920) with a passenger train approaching Khewra.